Minister for Prohibition & Excise V Srinivas Goud speaking at a programme in Nalgonda on Monday. 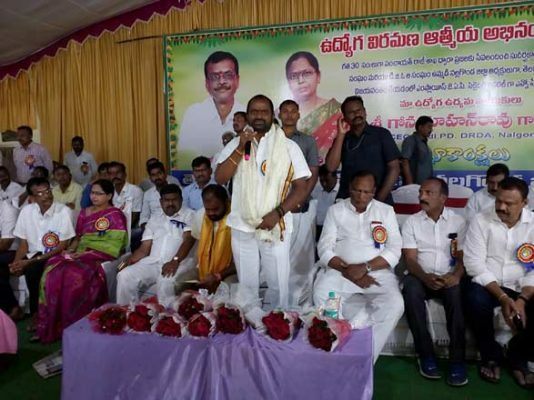 Nalgonda: Minister for Prohibition and Excise, V Srinivas Goud, urged government employees to be on guard since leaders of Opposition parties were conspiring to misguide them for political gains, here on Monday. He was speaking at a farewell function held for Additional Project Director of District Rural Development Agency (DRDA) and TGOs Association leader Gone Mohan Reddy. Srinivas Goud said employees should not believe reports being published in a section of media. Referring to news reports on possible reforms in Revenue Department, he said Chief Minister K Chandrashekhar Rao would discuss the issue with employees’ union and take a decision. This will not only bring a good name to the department and employees but would also benefit the people, he said. Stating that government employees were also part of government, Goud, who was also former TGOs leader, said criticising the government was like criticising the employees. Government employees in Telangana have played a key role in achieving separate State and now they are working towards creation of Bangaru Telangana by implementing welfare schemes and projects started by the State government. Nalgonda district had highest number of people with bone problems in the country due to fluoride menace, he said negligence of earlier governments in solving the issue was reason behind the situation. He has also called upon the retired employees to take part in reconstruction of Telangana paving way for Bangaru Telangana, which was dream of the Chief Minister. Coming down heavily on Andhra Pradesh Chief Minister N Chandrababu Naidu, the Minister said Naidu criticised Chandrashekhar Rao during election campaign thinking that it would fetch votes for the TDP. “But, this only angered the people of Andhra Pradesh, who are keen on learning from the achievements of Telangana State,” he said. Telangana Rashtra Rythu Samavaya Samithi president Gutha Sukender Reddy, Nalgonda MLA Kancharla Bhupal Reddy and leaders of TGOs Association also attended the programme.